Creature Crunch is an animated point-and-click comedy adventure. The plot is about a boy named Wesley turned into a monster by evil Dr.Drod. Wesley must escape the mansion of Dr.Drod by eating the right items to defeat monsters. 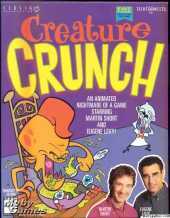 The game features the voices of SCTV veterans Martin Short and Eugene Levy.